A parade of raised beads encircles a delicately scalloped edge on the French Perle Bead White Square 4-piece Place Setting. This sturdy stoneware dinnerware set includes a dinner plate, accent plate, all purpose bowl and mug. 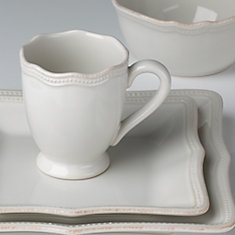 As versatile as it is beautiful, this dinnerware is dressy enough for formal occasions and casual enough for everyday. Width: Dinner plate 10 3/4", Accent Plate 8 3/4"